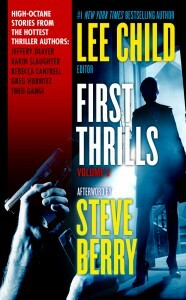 So who's hotter - Lee Child or Steve Berry? 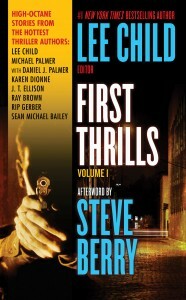 FIRST THRILLS includes never-before-published stories by New York Times bestselling authors Lee Child, Stephen Coonts, Jeffrey Deaver, Heather Graham, Gregg Hurwitz, John Lescroart, John Lutz (with Lise E. Baker), Alex Kava (with Deb Carlin), Michael Palmer (with Daniel James Palmer), Karin Slaughter, and Wendi Corsi Staub. The collection also serves as an introduction to a new generation of thriller authors, including Sean Michael Bailey, Ken Bruen, Ryan Brown, Bill Cameron, Rebecca Cantrell, Karen Dionne, JT Ellison, Theo Gangi, Rip Gerber, CJ Lyons, Grant McKenzie, Marc Paoletti, Cynthia Robinson, and Kelli Stanley. Also available June 7 as 4 mini e-books for just $2.99! 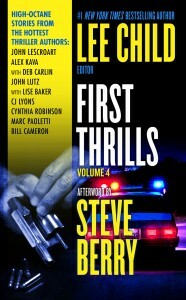 All proceeds from the sales of FIRST THRILLS have been donated by the authors to support ITW's efforts to promote and elevate the thriller genre. Leave a comment here to be entered to win a copy of this awesome short story collection! I'm honored to be a part of this amazing anthology. 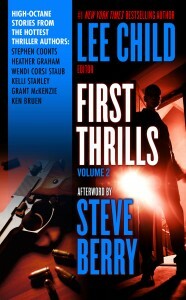 First Thrills will be available from Tor Books June 22 and features my short story KILLING CAROL ANN.